We put safety first in HighPark Sønderjylland. All of our instructors have gone through an internal climbing training. The safety on the tracks is also great. We use safety gear from the renown Swiss producer KANOPEO. The system we use is called “Speedrunner”. When you get on the track you get linked to the safety wire and you cannot terminate this link before you have completed the track. This way it is impossible to get off the track anywhere other than at the end. 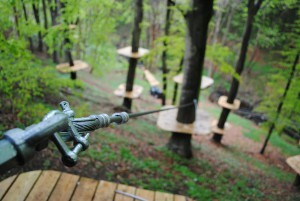 All of our guests are handed a climbing harness, helmet, safety carbine and a roller which is used on the zip-lines. Furthermore it is possible to buy gloves for use on the tracks. Before you are allowed to roam free on the tracks you must finish a short safety course. Here you will be instructed on how to us e the harness and the safety carbine. When you have shown the instructor that you have understood the instructions and is capable of using the gear correctly, the instructor lets you loose. All of our guests in HighPark Sønderjylland needs to sign an agreement before they use the tracks.